Joe DelSignore Sr. makes a jump. 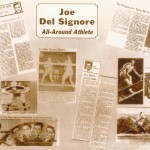 Joe DelSignore, Johnstown High School All-State selection in 1945. 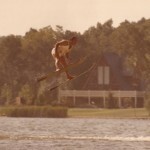 Set national records as a water skier while competing into his 70s. 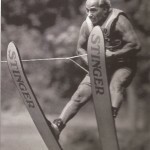 At age 72, Captured the Men’s 8 category championship at the Eastern Regional Championship of the United States Water Ski Association during an event in Sparta, Va., in 2000. Jumped 80 feet to win the age 70-74 division while setting the Men 8 national jumping record, eclipsing the previous mark by 17 feet. 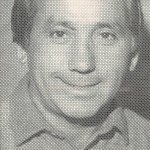 At age 53 in 1981, established a national jumping record of 124 feet while jumping from the left side of the ramp in the Men’s 5 Senior Division. Had a national record jump of 109 feet in the Men’s 4 Division in 1977. Earned the U.S. Army Middleweight Boxing championship in 1946. Had 17 victories in the ring. Established himself as one of the region’s top scholastic football players at Windber High and later Johnstown High in the 1940s. 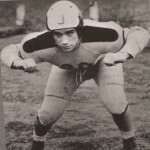 An Associated Press All-State lineman at Johnstown in 1944.